Energypedia is a wiki platform on renewable energy and energy efficiency which is open to the general public. 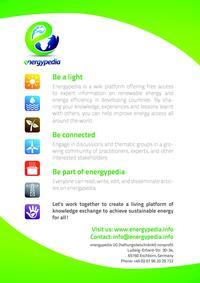 By providing free knowledge, energypedia tries to contribute to a sustainable future. If you would like to know more about wikis in general and working in energypedia in particular, please browse through the pages displayd below. Learn more about energypedia here. This page was last modified on 7 August 2013, at 15:31. This page has been accessed 20,768 times.